The Great Space is undergoing its fall transformation as the home of the Comprehensive Studio models. Peter Noonan and Yukari Yamahiro discuss her model. The Comprehensive Studio, ARCH 600, a graduate level design studio, has been working with structural mechanical and lighting consultants to design a Library. Now, the time has come to build the large scale model, at 1/2″ = 1′-0. Check out more pictures at the School’s Flickr page. Meanwhile, the ARCH 412 students were asked to demonstrate an understanding of structures and/or structural principles by means other than their homework and class quizzes. 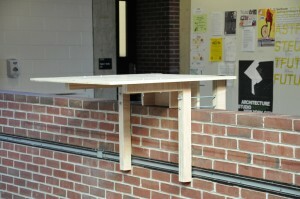 The students designed and fabricated arches, plaster domes, and several versions of a model shelf for the School’s mezzanine wall. More structures will be ready for viewing on Tuesday. 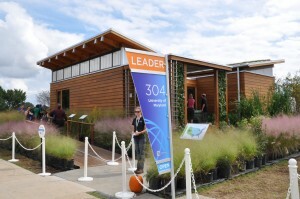 From time to time, I will post an blog entry by one of my staff, about a favorite building. Today’s entry is by Lucinda Philumalee, current MRED candidate and Historic Preservation degree holder. Eisenhower Executive Office Building: Eyesore or Icon? 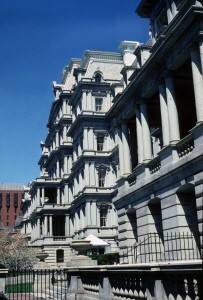 Located just west of the White House is a Federal building built in the Second Empire style that has been a staple of Washington DC since 1871. It was designed by a former Supervising Architect, Alfred Mullet, in the Second Empire style. Formerly known as the Old Executive Office Building, the Eisenhower Executive Office Building has been a source of strong opinion to many who encounter it. Named for the Second French Empire, Second Empire architecture is a style that became popular in the mid-to-late 1800s and is distinctly European. While Second Empire residential buildings are located around DC, the Eisenhower Executive Office Building is the one of the few, if only, Federal buildings built in this style. America’s most iconic Federal buildings were built in the style of Greek Revival, which became popular in the 18th and 19th century. DC was established as the nation’s capital in 1790; thus the built environment reflected what was prominent at the time. As a result, Americans have a predisposition of what Federal buildings should look like. Compounded with the fact that Americans are often turned off from anything that is iconoclastic with what they are used to representing the capital and the nation, the Second Empire Eisenhower Executive Office Building is often perceived with distaste. President Truman described the Eisenhower Executive Office Building as the greatest monstrosity in America. Mark Twain called it the ugliest building in America. Perhaps most graphic, historian and author Henry Adams referred to it as Mullet’s “architectural infant asylum.” Likely it was sentiments such as these, along with the notion that it was an inefficient building that put it at risk for demolition in the 1950s, however those plans never came to fruition. Once despised for its nonconformist style, opinions of the Eisenhower Executive Office Building have since neutralized. It was listed on the National Register of Historic Places in the 1960s and designated as a National Historic Landmark shortly thereafter. While many other Greek Revival style Federal buildings require a second glance for identification, the Second Empire Federal building is undoubtedly the Eisenhower Executive Office Building and a DC icon. Below are a few pictures; If you travel to DC you can make your own decision! Eisenhower Executive Office Building. Picture form A. D. White Architectural Photographs, Cornell University Library, via The Commons. Eisenhower Executive Office Building from the street. Image from the School of Architecture, Planning, & Preservation, Visual Resources Collection. What should I do with my old slides? Here in the Visual Resources Collection we are taking an inventory of everything in the room. We have LCD projectors, slide projectors, cameras, video cameras, light sets, some books and travel guides; even film cameras of the Nikon variety. However, the slides, slides, slides, are what I have in the most quantity. Now, slides are small, so it takes alot of them to take up any amount of space – we have at least 265 drawers full of slides. As part of the stocktaking, the Graduate Assistants are looking at boxes of slides, drawers of slides, scans of slides. We have your pink variety, your purply-orange variety, your overexposed and your really dark variety. Then there are the fabulously colored Fujichrome and Kodachrome slides of trips from around the world that our professors and students have shared with us over the years. Records of moments in time, a particularly sunny day, a freshly painted facade, a brand new structure or a really old structure. Images that document not only an architecture, but a city, a style of car or hairdo, caught on the film chip. The challenge for me and my student assistants is to decide what stays and what goes. What is relevant to the School’s mission, and what is just taking up space. Is this slide primary source material or outdated copywork from a book that has been re-issued and updated umpteen times since that slide was taken? For slides that are going to go, here is a beautiful and useful project: Curtains. Or maybe a handbag would be nice. I plan to post more lovely pictures as we continue with the collection assessment. Architecture student works on a drawing in the Great Space during studio. 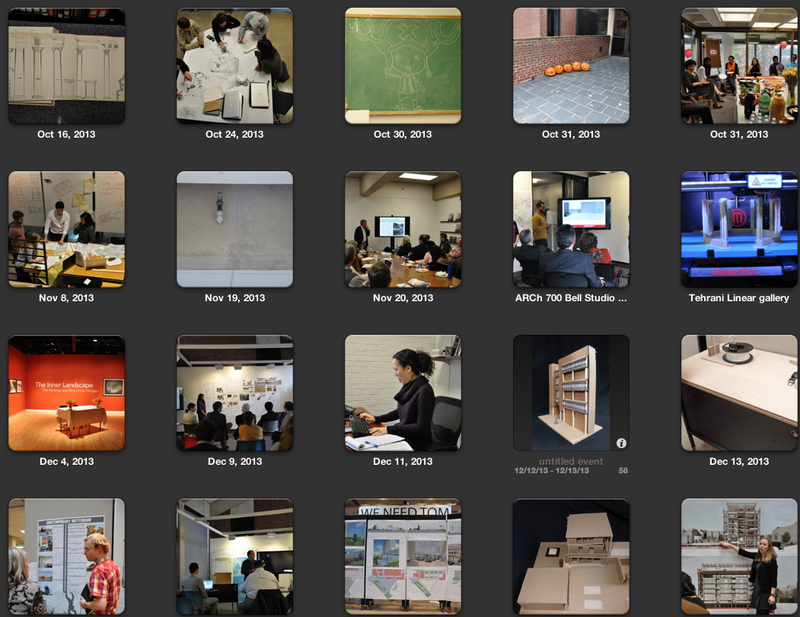 The School of Architecture, Planning and Preservation has a Flickr account with pictures from the various programs. 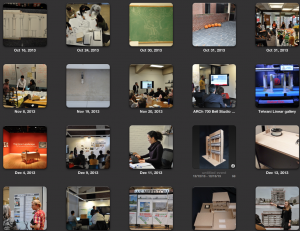 Most recently, we have documented activities in the studio sequence of the Architecture program. Is the artist always learning? Student and studio begin with the same 4 letters, but how related are they? My favorite image for this week is this detail of the Palazzo del Te. It comes from the School of Architecture, Planning and Preservation’s Visual Resources Collection, and was taken by Professor Tom Schumacher, on one of his many visits there. Tom was a fan of black and white film, and we had many discussions of pattern, contrast, and what can be revealed about composition once the color is removed. This image is a nice study of black and white and gray, but it also reveals several of the many playful elements of the Palazzo del Te, designed by Guilio Romano, and constructed between 1524 and 1534. Maryland WaterShed Still in First Place! We wont give up the top spot.